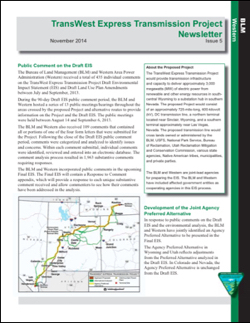 Nov. 26, 2014 — The U.S. Bureau of Land Management and Western Area Power Administration have published their fifth public newsletter about the status of the Environmental Impact Statement for the TransWest Express Transmission Project. BLM and Western are the joint lead federal agencies preparing the EIS, in collaboration with multiple federal, state and local cooperating agencies. The November 2014 newsletter is available on the BLM project website, which hosts all of the NEPA-related documents that are available to the public. According to the newsletter, BLM/Western "have jointly identified an Agency Preferred Alternative to be presented in the Final EIS." This route — shown on the newsletter map — is the result of continued environmental analysis and extensive public comment that was received after the Draft EIS was published in July 2013. "The Agency Preferred Alternative in Wyoming and Utah reflects adjustments from the Preferred Alternative analyzed in the Draft EIS," the newsletter says. "In Colorado and Nevada, the Agency Preferred Alternative is unchanged." The update also announces that "The Final EIS is targeted for release in April 2015." The TWE Project is a 600 kV, direct current transmission line designed to facilitate renewable energy delivery and access, while providing an important regional upgrade to the western U.S. power grid. The project will interconnect with the existing transmission grid near Sinclair, Wyo., and the Marketplace Hub in Boulder City, Nev. The TWE Project was first proposed in 2007. TransWest Express LLC acquired the project in 2008. In October 2011, the TWE Project was selected as a federal "Rapid Response Team for Transmission" project.